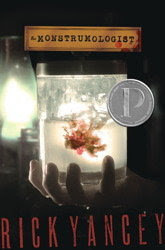 The Monstrumologist by Rick Yancey. Simon & Schuster. 2009. Personal copy. The Plot: 1888. Will Henry, 12, is taken in by his father's employer, Dr. Pellinore Warthrop, after Will's parents die in a fire. Dr. Warthrop's specialty? Monsters. Or, to be scientific, monstrumology, the study of monsters. "There are monsters that lie in wait under our beds." The object of this particular adventure? Anthropophagi. Deadly man-eaters, with no heads -- eyes are on shoulders, shark-like mouths in the middle of the chest -- they are fast, killing and tearing apart their human food. The Good: This seemed to be written with a checklist of "all things Liz B likes in a story." Thanks, Rick, for thinking just of me! I guess some other people liked it, also; it did get a Printz Honor. And thus the story begins. 1888. Will Henry is 12. But these are not a boy's journals: they are written forty years after the death of Dr. Warthrop. Full stop as we look at this great framing device. Will's story, told as an adult, capturing the spirit and point of view of a twelve year old while having some distance and wisdom of an adult. Will insists his memory of boyhood is sound ("I can't recall what I had for breakfast this morning, but I remember with nightmarish clarity that spring night in 1888..."); at another time he acknowledges that the confession of someone, while true to memory, "spare[s] the reader ... somewhat tiresome and frustrating divagations." But wait! There is more! As Rick Yancey has transcribed Will's journals, Will's words were "edited only for spelling and correction of some archaic uses of grammar." Layers upon layers, with questions of what is told when and how. Delicious! While short, those quotes reveal that Will's journal is written in nineteenth century style. Divagations indeed! Like Octavian Nothing, the prose seems true to time yet the story remains accessible. A monster story that is not supernatural! The Anthropaphagi are simply creatures, not yet discovered and documented sufficiently by scientists so designated "monsters." Dr. Warthrop is the type who, as he hunts these creatures, scoffs at the idea of witchcraft or demons. He is a scientist, thank you very much. Since this is the start of a series, I am besides myself trying to guess what monster next gets the monstrumologist treatment. I hadn't realized, until reading this book, how much of the horror I'd been reading was more supernatural. Very refreshing to read something with no spells or witchcraft or demons. What else? There are some reveals that the reader may or may not guess; I did not. There is a terrific sense of place, of time, of setting. I was reminded of Lovecraft. I wonder, if scholars of horror and Lovecraft and the 19th century, may catch things and references that I do not. There is, as one would expect from man eating monsters, gore. Blood. Destruction. Death. The death of innocents. Hard men making hard choices. As someone once said (and I am getting conflicting sources via the Internet), "We sleep safe in our beds because rough men stand ready in the night to visit violence on those who would do us harm." Some of the characters in this book believe that gives them the excuse for violence. And violence there is, make no mistake. Did I mention the blood? And, unexpectedly, humor. All I have to say, believe it or not, is John Jacob Jinglehiemer Schmidt. Finally, dear reader, just how good was this book? I bought my own personal copy. Edited to add: On my list of Favorite Books Read in 2010. See Sidebar. And I didn't want to continue reading last night! I stopped on page 78. All those adjectives! :) I moved onto something else. But I understand why it's an award winner. Sound way too complicated. Hope the book is clearer. This book sounded really good when I first saw it! Glad you reccomended it through your great review! Ms Hill, yes, definately in the style of 19th century with all those words. But it *is* worth it. Jan & The Critic, let me know your thoughts on the book if you read it. Loved this book - listened to the audio (which matched the format extremely well, I thought) and was very happy when it nabbed a Printz Honor. I, too, bought my own copy. Glad there are going to be more! I loved loved loved this book. I couldnt believe i found it in the teen section. I ended up reading and rereading paragraphs not because it was hard to understand but because it was beautiful. The part where Will is cleaning brains out of his hair saying what part of you is this is it your pride...that was the most amazingly written someone getting their head blown off i've ever read...lol..